Furnishing. 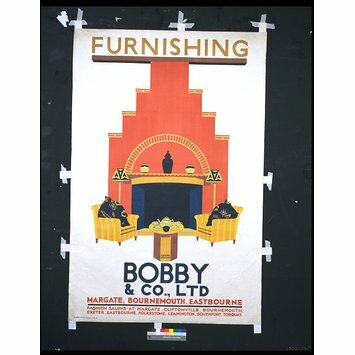 Bobby & Co., Ltd.
'Furnishing. 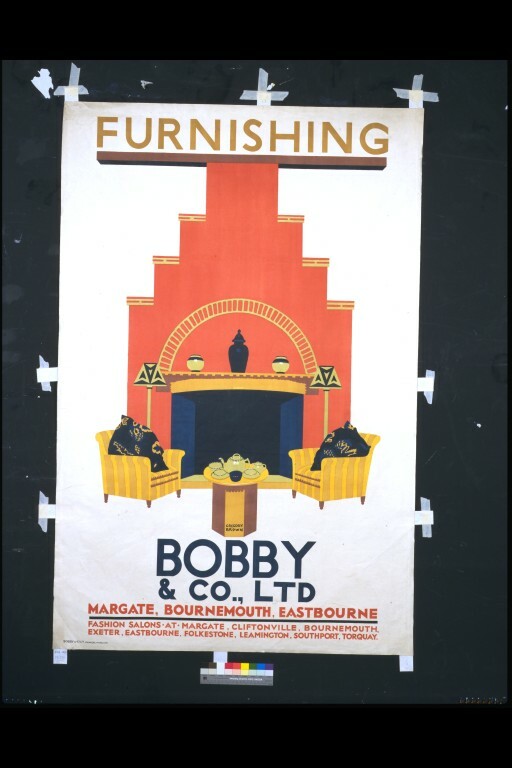 Bobby & Co., Ltd.'; Poster advertising branches of the department store, depicting two armchairs flanking a tall brick chimney-piece, with a small table set with teapot and cups between them; Colour lithograph, flat colours on white background, text in red, dark blue and brown; Signed. Bobby & Co were provincial stores with numerous large shops in the South of England. They stocked medium to high-priced goods and catered for customers who had moved to the new suburban villas and semi-detatched houses of the 1920s. This poster, which appropriately shows a cosy suburban tea (for two), mixes up flashy new Art Deco ideas from Paris, notably in the textiles and lamp shades, with the English Arts and Crafts cottage style in the tea set and the brick chimney-piece, shown hugely enlarged for greater effect. Gregory Brown was a founding memeber of the Design and Industries Association (DIA), besides being established landscape painter and poster designer; he also designed jazzy abstract patterns for the textile firm of William Foxton. Bobbys launched an extensive poster campaign in 1924-6 following the example of London Underground and Derry & Toms, both of whom has employed Brown. The results were widely admired by contemporary commentators on commercial art. 'Furnishing. 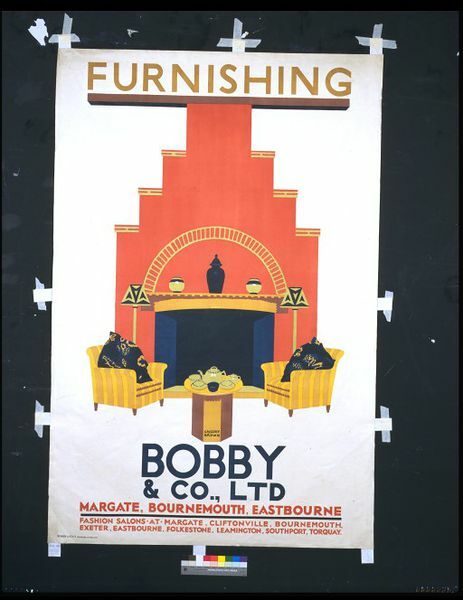 Bobby & Co., Ltd.'; Poster advertising branches of the department store, depicting two armchairs flanking a tall brick chimney-piece; Colour lithograph; Signed; By F. Gregory Brown; Printed by Bobby & Co., Ltd. Printers, Margate; Great Britain; 1924.